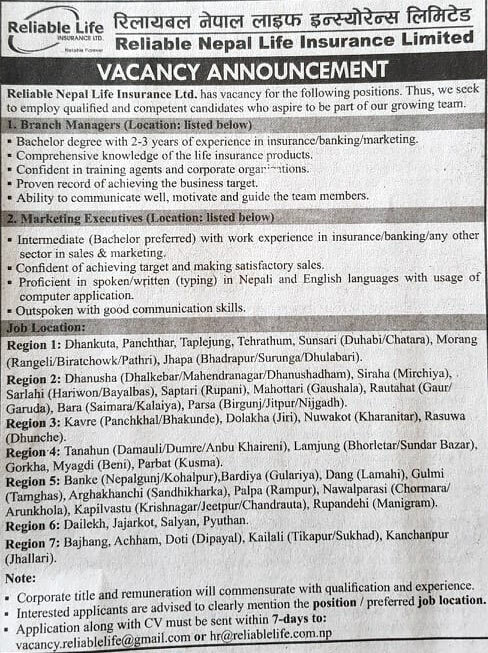 Reliable Nepal Life Insurance Ltd. has vacancy for the following positions. Thus, we seek to employ qualified and competent candidates who aspire to be part of our growing team. > Bachelor degree with 2-3 years of experience in insurance/banking/marketing. > Comprehensive knowledge of the life insurance products. > Confident in training agents and corporate organizations. > Proven record of achieving the business target. > Ability to communicate well, motivate and guide the team members. > Intermediate (Bachelor preferred) with work experience in insurance/banking/any other sector in sales & marketing. > Confident of achieving target and making satisfactory sales. > Proficient in spoken/written (typing) in Nepali and English languages with usage of computer application. > Outspoken with good communication skills. - Region 1: Dhankuta, Panchthar, taplejung, Tehrathum, Sunsari (Duhabi/Chatara), Morang (Rangeli/Biratchowk/Pathri), Jhapa (Bhadrapur/Surunga/Dhulabari). - Region 2: Dhanusha (Dhalkebar/Mahendranagar/Dhanushadham), Siraha (Mirchiya), Sarlahi (Hariwon/Bayalbas), Saptari (Rupani), Mahottari (Gaushala), Rautahat (Gaur/Garuda), Bara (Saimara/Kalaiya), Parsa (Birgunj/Jitpur/Nijgadh). - Region 3: Kavre (Panchkhal/Bhakunde), Dolakha (Jiri), Nuwakot (Kharanitar), Rasuwa (Dhunche). - Region 4: Tanahun (Damauli/Dumre/Anbu Khaireni), Lamjung (Bhorletar/Sundar Bazar), Gorkha, Myagdi (Beni), Parbat (Kusma). - Region 5: Banke (Nepalgunj/Kohalpur), Bardiya (Gulariya), Dang (Lamahi), Gulmi (Tamghas), Arghakhanchi (Sandhikharka), Palpa (Rampur), Nawalparasi (Chormara/Arunkhola), Kapilvastu (Krishnagar/Jeetpur/Chandrauta), Rupandehi (Manigram). - Region 6: Dailekh, Jajarkot, Salyan, Pyuthan. - Region 7: Bhajhang, Achham, Doti (Dipayal), Kailali (Tikapur/Sukhad), Kanchanpur (Jhallari). > Corporate title and remuneration will commensurate with qualification and experience. Interested applicants are advised to clearly mention the position / preferred job location.